A Chinese investor has paid $8,888,888 for a prime development site in the Melbourne CBD. The property at 415-417 Collins Street was sold for the auspicious figure at a public auction onsite - the number eight is considered lucky in Chinese culture and indicates 'wealth' or 'fortune'. The site fetched $2.5 million above reserve on a yield of 2.2 per cent for the owner, Probuild founder Phil Mehrten. CBRE's Josh Rutman, Mark Wizel, Lewis Tong and Paul Tazamalis were the selling agents. The 87sqm four-level building is currently leased to established tenants including the Sherlock Holmes Pub and Cafe 417. 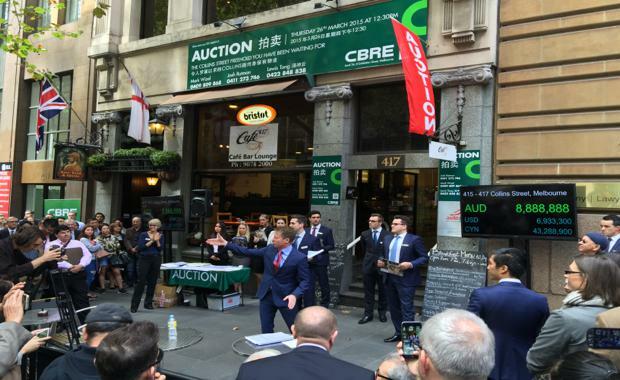 Mr Rutman told The Australian Financial Review: "No one expected a result like that - but buyers seemed to understand the rarity of the opportunity given that this was the first freehold auction in Collins Street for over six years."